Think the President supported your view of the oilsands? Browse: Home / oilsands / Think the President supported your view of the oilsands? President Obama’s speech yesterday had something in it for everybody, and the most remarkable thing for me on the day after the speech is that both the oil powers in Calgary and their usual allies the NRDC agreed that it was a positive development. At least the objections of Greenpeace USA restored some balance to the universe. I think, in many cases, interested parties were simply listening for what they wanted to hear. 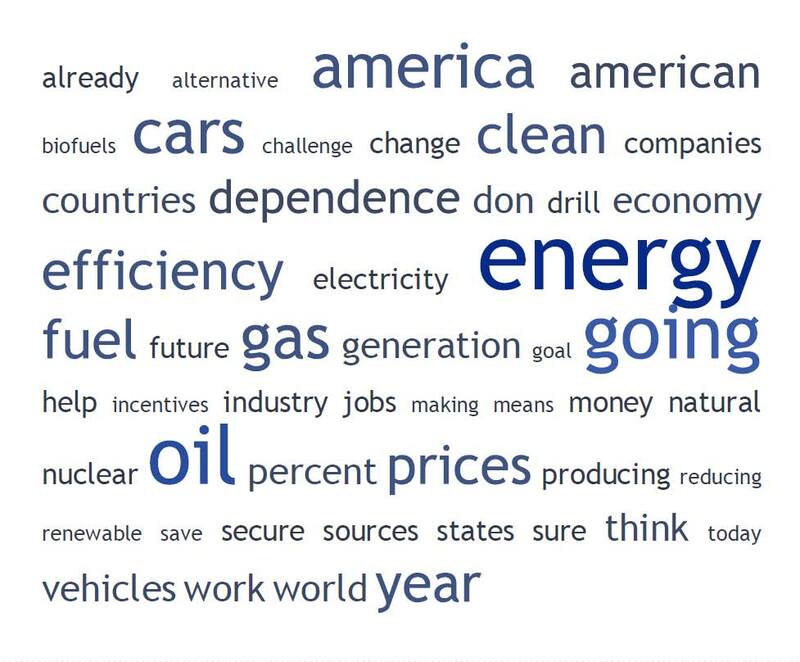 The figure below shows a tag cloud of the top 50 words used in the President’s address. When you see words like clean, biofuels, reducing oil dependence, and alternative being used, that is generally not good news for the largest exporter of oil to the US. The words domestic oil production, drill, and clean coal are not generally on the positive side of the ENGO lexicon. I think that, as people digest the President’s remarks, people will realize that his remarks amount to a lot of aspiration, a little realism, some retail politics, and little else. In the end, I don’t think that it was really good news or bad news for anyone. Premier Stelmach was happy today. He was quoted in the Journal as saying that President Obama was, “”recognizing Alberta is a very stable supplier of oil.” President Obama did identify Canada, Mexico, and Brazil as,”stable, steady, and reliable sources,” of oil, but I am not sure this is enough for us to be giggling like a schoolgirl after a smile is cast her way from a member of her favorite boy band. If you read the text around his one mention of Canada, it is not so rosy. “We can cut our oil dependence — we can cut our oil dependence by a third…and…our best opportunities to enhance our energy security can be found in our own backyard.” In his speech and the accompanying Blueprint, the word Canada appears once, and the words oil sands and Alberta are both absent entirely. Imagine you are a contractor, at a dinner hosted by your largest client, and he or she takes the stage to lay out a strategy for reducing the company’s dependence on contractors. Is your first reaction to get on the phone to your boss and say, “Great news! He mentioned us!” Your first reaction should be to call a meeting to make sure that you represent a superior service provider relative to the alternatives which your client might be considering. This is what Alberta should be doing today. In President Obama’s speech, he was clearly committing to energy sources which could deliver on environmental attributes including GHG emissions. He was also clearly concerned about price volatility. Importing oil from Alberta does not satisfy many of his core supporters who are pushing him on the first issue, nor does it do much to help with the second since Alberta oil exports are generally priced to the world market. Yes, we have a significant advantage over some other suppliers of oil into the US, but that advantage is not a trump card. The oil sands are also a long game. The measures the President outlined yesterday were exactly what OPEC worries about when they discuss demand destruction. That, as a result of high or volatile prices, alternative energy sources are encouraged even though they are initially more expensive. As those sources mature, the costs come down, and the quantity of oil demanded at any given energy price falls. If OPEC is worried about it, when they hold many of the world’s low cost reserves, Canada and Alberta should be worried about it too. Our oil sands reserves are likely worth close to $1 trillion at today’s prices, and this is not something with which we should gamble. Yes, the US will want as much oil as we can produce for the foreseeable future. However, high and volatile oil prices will drive them to find alternatives, and so we must not take the forecasts of future production/demand for granted. Now, some environmental groups were also happy with what they heard because Obama used magic words like electric cars, energy efficient buildings, and a clean energy strategy which will return to US to a leadership role in the world’s clean energy economy. He was short the complete set though, as he missed green jobs and smart grid. The President’s speech should be sobering for the environmental movement as well because he made no bones about where the solution to America’s dependence on foreign oil really lies. I wrote a while back that high oil prices and the push to energy security was not necessarily a panacea for environmentalists, and this came true yesterday. This was as close as the Obama administration was prepared to get to “Drill baby, drill,” but he was not far off. “To keep reducing that reliance on imports, my administration is encouraging offshore oil exploration and production….and…promot(ing) rapid, responsible development of (onshore) resources (on existing leases)….We’re also exploring and assessing new frontiers for oil and gas development from Alaska to the Mid- and South Atlantic states, because producing more oil in America can help lower oil prices, can help create jobs, and can enhance our energy security…” President Obama also talked a lot of natural gas as the primary alternative to oil. He referenced T. Boone, in case you missed it. I could go on and on, but will cut off here. I am curious. After taking a second look at President Obama’s speech, do you still think he said what you first thought he said about oilsands, energy security, and the future of the US energy sector? Thanks. Had not seen this blog before. He has obviously seen more than a few speeches on American energy security. Key will come in the next few months to see what legislative projects go forward, I guess.